After many years of collaboration between Micol Assaël and KÖNIG GALERIE the artist’s first solo exhibition will be shown in the gallery rooms. Assaël will be displaying a new installation of her work Mindfall, which she presented previously at the Manifesta 5. 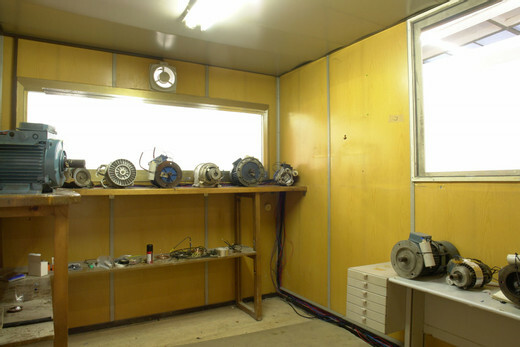 Inside a factory’s former office and electrical distribution center, are 21 discarded motors installed on worktables. The office’s windows are extremely fogged, blocking the spectator’s view. Upon entering the booth, the engines are constantly turning on and off, so that several are activated at once. They work at a very low energy level and their reduced power causes them to overstrain. Between clangs and groans they sluggishly perform their pointless labour, overheating and filling up the space with smoke and a biting smell of gasoline. In turn, the intermittent frequencies of the motors produce vibrations and their tones come together in a harmony of noises, a materialization of sound which can be felt throughout the body. In addition, for this exhibition’s opening, the musician Mika Vainio will amplify these frequencies and arrange them into a composition. The work of Assaël plays with the human body’s possibilities of sensory perception. “Assaël subjects it to extreme, physically uncomfortable, and often even risky experiences”, writes Roberta Tenconi. According to Adam Szymczyk, Assaël connects to the time in art history in which artists started reacting against body art with minimal and conceptual works in order to question the relationships between artist, work and observer: “Assaël seeks to abolish the dialectics of the self and the outside world still present in previous body-oriented art (…). In this new situation, the body should belong to no one, just as in an experiment conducted in the objective, neutral conditions of a lab, or in any meditative exercise leading to sensory deprivation and freedom of the mind (…).” Assaël’s aesthetic arrays are rigorously constructed upon the laws of Physics, Mechanics and Logics, often requiring the cooperation of Engineers and Mathematicians - like for Chizhevsky Lessons (2007) in the Kunsthalle Basel where she turned a 200m² hall into a giant electrical condenser. Based on physical assemblages or mechanical structures, the installations result in spaces which allow for unusual sensory and intersubjective experience. In this way, Assaël creates a situation in which the observer himself becomes a converging point between technics and science and art and poetry. Micol Assaël (*1979) lives and works in Rome and Moscow. She participated in the 4th Berlin Biennial (2006), the 50th and 51 th Venice Biennial and in the Manifesta 5 (2004). In 2005 Zero…, Milano showed her solo exhibition Free Fall in the Vortex of Time. On 2007, she was offered a solo show at the Kunsthalle Basel and a monograph was published (Electa, Basel). Currently, Assaël’s work can be seen in La parola nell’arte in the Museum for contemporary art of Trento and Rovereto (Italy), from the 10th of November to the 6 th of April. 2008 she will participate in the Biennial in Sydney.